But what can you do if you do not know how to create a HTML document? 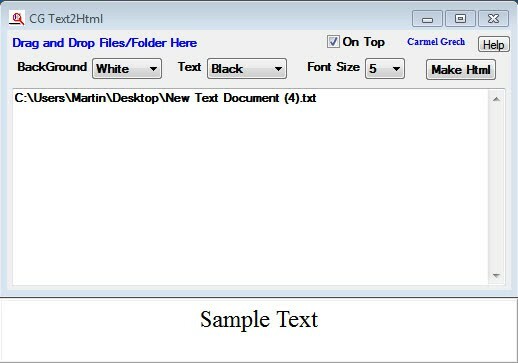 You could use an HTML editor or, if you just need to turn a plain text file into HTML, use the free software Text2HTML. You should not expect wonders though. Text2HTML is as basic as it gets. More about that later. When you start the portable software you will notice several configuration options at the top of the window. Here you can change the background and text color and the font size of the HTML document. And that’s it. No title, headings, images or other features are supported by the application. The program displays a preview of how the text will look like in the HTML document. To convert text documents all you need to do is to drag and drop files or entire folders with files into the program interface. Text2HTML will list all files in its interface. All that’s left to do now is to click on the Make HTML button to turn all listed text documents into HTML documents. The file is created in the same directory as its source text document. Please note that the program supports HTML tags in those documents. If you know your way around HTML you could add formatting options directly to the documents. The more you work on the documents this way the less helpful the software becomes on the other hand. Text2HTML is a handy program for users who do not know HTML but need to create HTML documents, for instance to publish them in the company Intranet or on the Internet. If the provided options are not sufficient you could look at free HTML editors such as BlueGriffon or Bluefish (Linux) instead which offer more functionality but are more complex to work with at the same time. Interested users can download the portable software Text2HTML from the developer website. The application is compatible with 32-bit and 64-bit editions of the Microsoft Windows operating system. This entry was posted on Monday, October 10th, 2011 at 9:31 am	and is filed under software evaluation, tech tips. You can follow any responses to this entry through the RSS 2.0 feed. Both comments and pings are currently closed.